Lord Ganesha , son of Lord Shiva and Goddess Parvati, is worshiped by Hindus as the god of beginnings, knowledge, wisdom, intellect and remover of obstacles. One always starts any prayer, ritual or occasion by worshiping the Beloved Elephant God. Lord Ganesh blessings are also sought before starting any new venture. 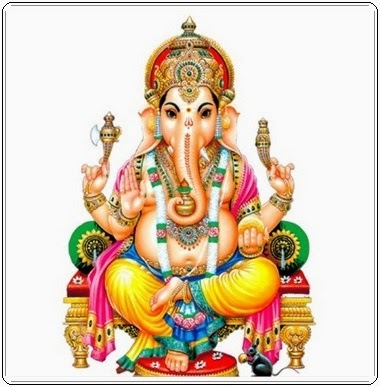 Lord Ganesha is also referred to as Ganapati, Gajanana, Vinayaka, Vighneshawar and Pillaiyar. The Birthday of Sri Ganesh is celebrated as Ganesh Chaturthi Festival. O Lord Ganesha who has a large body, curved trunk and brightness of a million suns, please remove all obstacles in my work always. Ganesha Mantras are full of energy and power of Lord Ganesha and these mantras when chanted with genuine devotion removes obstacles and troubles in life and blesses with success and prosperity. Ganesh Mantras are also referred to as Siddhi Mantras and can remove depression, confusion, jealousy and fear from our minds. "Aum shrim hrim klim glaum gam ganapataye vara varada sarva janamme vashamanaya svaha"